Notes: The default Cobra agents through the end of the first season, thereafter superseded by Vipers. Both males and females appeared wearing the 1982 outfit (though females usually did not wear masks). Cobra Troopers in the series had white straps that met in the center of the back rather than off to the side; usually no gloves or shoulder/leg detail. Early ads for Marvel comics pictured Cobras with blue face masks and gloves, and yellow belt and straps. A female Cobra in My Brother's Keeper had black backpack straps in most shots. The 1989 Python Trooper outfit appeared briefly in DiC's Operation Dragonfire. Accessories: black Dragunov SVD sniper rifle with no trigger guard (new). One of the nameless, faceless legions of COBRA Command. Each COBRA is highly skilled in the use of explosives, all NATO and Warsaw Pact small arms, sabotage, and the martial arts. Qualified expert: Skorpion (VZOR61) Machine Pistol; Dragunov (SVD) Sniper's Rifle; Uzi Submachine Gun; M-16. "COBRAS swear absolute loyalty to their fanatical leader... COBRA Commander. Their goal...to conquer the world for their own evil purpose!" Variations: Re-tooled in 1983 to accommodate swivel-arm battle grip and a new waistpiece design. Yojoe.com lists swivel-arm Cobra as version 1.5. Toy Notes: Item #6410. The helmet, Cobra emblem, and rifle all differ from the prototype pictured in the 1982 catalog and commercials. There are unverified rumors that some Cobras may have been packaged with weapons from other 1982 figures. Reissues: The straight-arm figure was boxed in fall 1982 with the Sears-exclusive Missile Command Headquarters, along with Cobra Officer and Cobra Commander. Evidently the same three figures were reissued in fall 1982 in a J.C. Penney three-pack. (It is not listed on Yojoe.com, but a post in the Yojoe.com forums linked to a boxed copy sold on eBay in 2008.) More common was a J.C. Penney three-pack consisting of two Cobras and a Cobra Officer, with Rock 'n Roll's machine gun and bipod and a light green or dark green copy of Zap's thin-handled bazooka as the Troopers' accessories. The swivel-arm version of Cobra was released in stores as part of the spring 1983 regular carded figure assortment. (Item #6425). Accessories: black or white rifle (82 Cobra Officer's). The PYTHON TROOPER is the basic infantryman of the Python Patrol and is cross-trained in at least two support skills such as computer operator, cook, and ordinance supply specialist. Unlike most armies where specialization is the norm, Python Patrol expects its computer operator to be as proficient with assault rifles as he is with word processors. "When this guy takes up his position on the battlefield, you know you're in for one heck of a fight! He's so well disciplined, trained, and mentally prepared for battle that only total victory will satisfy him! The Python Trooper swears absolute loyalty and allegiance to Cobra Commander, his supreme ruler!" Variations: A few copies came with white rifles. Accessories: black pistol (91 Dusty's) black submachine gun and stock (91 Dusty's), black backpack (91 Dusty's), black figure stand (common). 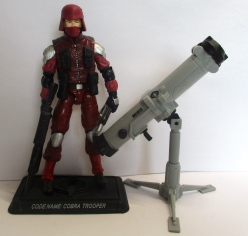 The COBRA Troopers are the most basic, bottom-of-the-barrel soldiers in the COBRA regime. They have to work their way up to even become Vipers. They come from all over the world. They are thugs, mercenaries, pirates, and assorted lowlifes that have committed so many atrocities that the only organization that will have them is COBRA. They are given the most basic level of training, which amounts to little more than organizing a handful into a reasonably cohesive group, giving them the most basic of uniforms, handing them equipment, and telling them to go out and cause trouble. The COBRA Trooper divisions were the first of COBRA's notable forces. They're not specialists. They're not qualified for anything [other] than the most low level of infantry. The only advantages they have are pure nastiness and sheer numbers. From General Hawk's Files: "Maybe we shouldn't be surprised that COBRA was able to build up this most basic level of trooper divisions once again. We seem to live in a society that creates people who feel hostile towards established authority, disenfranchised and apart. COBRA gives them the semblance of purpose and belonging. Don't get me wrong. I don't sympathize with them. Ultimately, they're a too-well-organized, too-well-equipped, too-numerous, band of thugs. And they're so stupid that a few of them we've captured have to be reminded to breathe." Toy Notes: Two copies were carded in a Toys 'R Us-exclusive Cobra Infantry Team three pack with one Cobra Officer. Item #57064. Accessories: black M16A1 assault rifle with handle on top and clips for sling (new), black rifle (03 Tunnel Rat's). The COBRA TROOPER infantry forces are the most basic, bottom-of-the-barrel soldiers in the COBRA regime. They have to work their way up to even become COBRA VIPER forces. They are thugs, mercenaries, pirates, and assorted lowlifes who are recruited from all over the world. They are given the most basic level of training, which amounts to simply organizing a handful of them into a reasonably cohesive group, giving them the most basic of uniforms, handing them equipment, and telling them to go out and destroy, sabotage, and wreak havoc. The COBRA TROOPER divisions are not specialized, but instead are sent in as basic infantry ground forces. Their key advantage is their pure nastiness and sheer numbers. Toy Notes: Carded in a three-pack with Baroness, Cobra Commander, and a reprint of Marvel #1. Item #60355. Accessories: black rifle (02 Neo-Viper's), black two-piece bazooka with mount on rear half and grip and sight on front half (new), tall blue, mildly flared helmet with slight widow's peak and red Cobra emblem (new), dark blue belt (04 Ghost Bear's). The COBRA TROOPER infantry forces are the most basic, bottom-of-the barrel soldiers in the COBRA regime. They have to work their way up to become COBRA VIPER forces. They are thugs, mercenaries, pirates, and assorted lowlifes who are recruited from all over the world. They are given the most basic level of training, which amounts to simply organizing a handful of them into a reasonably cohesive group, giving them the most basic of uniforms, handing them equipment, and telling them to go out and destroy, sabotage, and wreak havoc. The COBRA TROOPER divisions are not specialized, but instead are sent in as basic infantry ground forces. Their key advantages are their pure nastiness and sheer numbers. Reissues: Remaining copies were sold at Toys 'R Us stores as early as February 2006, when the DTC line was discontinued. Accessories: black rifle (91 Red Star's), black rifle (84 Baroness's). Toy Notes: Two copies were carded in a three-pack with Lady Jaye and a reprint of Marvel #44. Item #13026. Accessories: black rifle (07 Cobra Officer's), black knife with silver guard and blade (07 Cobra Officer's), blue swept-back helmet with slight widow's peak (new), black webgear: belt and chest straps with attached pistol and silver buckle (new), black Cobra figure stand ("COBRA (THE ENEMY)"). "COBRA troopers swear absolute loyalty to their fanatical leader...COBRA COMMANDER. Their goal...to conquer the world for their own evil purpose!" Toy Notes: Boxed in a set with Cobra Commander, Storm Shadow, Destro, Baroness, and a sound box that played a portion of the cartoon theme music. Item #26758. This version's head is bald to allow a better fit for the helmet. Accessories: black rifle with brown grip (07 Cobra Officer's), black knife with silver guard and blade (07 Cobra Officer's) blue helmet (07 Cobra's), black webgear with silver buckle (07 Cobra's), black Cobra figure stand (either "COBRA (THE ENEMY)" or "COBRA TROOPER"). Toy Notes: Item #25980. This version's head is bald to allow a better fit for the helmet. Toy Notes: Boxed in a set with Storm Shadow, Cobra Commander, Cobra Vehicle Driver, Cobra Air Trooper, and a sound box that played a portion of the animated movie's theme music. Item #26758. This version's head is bald to allow a better fit for the helmet. Accessories: black rifle (07 Cobra Officer's), black knife with silver guard and blade (07 Cobra Officer's), blue helmet (07 Cobra's), black webgear with grey chest straps and black pistol (07 Cobra's), black Cobra figure stand. Toy Notes: Boxed in a Toys 'R Us-exclusive three-pack with Cobra Officer and Cobra Commander. Item #32150, set 3 of 3. This version's head has painted dark brown hair, unlike the previous bald versions from this mold. Accessories: brown rifle (08 Tomax's), black knife with silver guard and blade (07 Cobra Officer's), blue helmet (07 Cobra's), black webgear with white chest straps and filled-in buckle (07 Cobra's), black catalytic elements cart with handle and clear boxes of red, yellow, and blue elements (new), black Cobra figure stand. 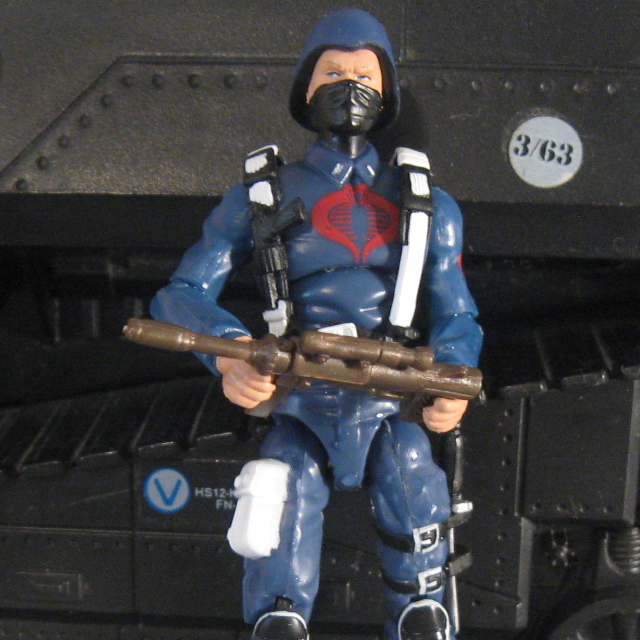 COBRA TROOPERS are the basic infantry forces under the command of COBRA COMMANDER. Made up of mercenaries, thugs, and assorted criminals, COBRA TROOPERS are sent in to stop the G.I. Joe team from getting the rare elements needed to complete their M.A.S.S. DEVICE machine. They're trained to battle in any location - in the chilling Arctic, the silent sea depths, or the crater of an erupting volcano. Their key advantage isn't just their training; it's also their sheer nastiness. Every one of them is bad to the bone--hey have no code of honor and will use sabotage as easily as their weapons if it means they win and the other guy loses. "If we can't defeat them with firepower, then we'll get them with pure meanness." Toy Notes: Boxed with Cobra Trooper, Baroness, Sgt. Stalker, M.A.S.S. Device console, and The M.A.S.S. Device DVD. Item #32750. This version has a bald head like the 2007 versions. Accessories: black rifle (07 Cobra Officer's), black knife with silver guard and blade (07 Cobra Officer's), blue helmet (07 Cobra's), black webgear with silver buckle (07 Cobra's), black Cobra figure stand. He's one of the nameless, faceless infantry troopers in the vast COBRA army. These ground fighters have given their allegiance to COBRA COMMANDER (but just until someone more powerful usurps the head snake). The majority of these troopers come from the countless criminals and lowlifes that are found in every shadowy corner of the world, eager for a chance to wreak havoc on a grander scale and enticed by the promise of rich plunder. They are highly skilled in various weapons, qualified in the use of explosives, and experienced in the martial arts. Toy Notes: Item #37429. This version has a bald head like the 2007 versions. Accessories: dark brown rifle (08 Ripper's), three dark brown mines (08 Tripwire's), tan helmet (07 Cobra's), tan vest with red pads, black belt and pockets, and silver grenades (08 Cobra Viper's), dark brown backpack (08 Tripwire's), dark brown mine detector (08 Tripwire's), black Cobra figure stand. COBRA troopers are thugs, mercenaries, pirates, and assorted lowlifes who are recruited from all over the world. They are all given basic training to organize them into a reasonably cohesive group with the skills and equipment to go out and destroy, sabotage, and wreak havoc. Their key advantages are pure nastiness and sheer numbers. Some troopers receive specialized training in mines, detonators, and other explosive devices used to destroy or disable targets. This trooper is part of a COBRA desert assault squad; he combines his extreme conditions training with his explosives expertise to devise desert-region attacks and traps for the G.I. JOE team. "We're the grunts of the COBRA organization, the guys who pour into the field and fight for all we're worth, overpowering the enemy with machine guns, meanness - and well-placed explosives." Toy Notes: Sold in an online-exclusive boxed set with two copies of Crimson Guard, Cobra Officer, Maj. Bludd, and two other versions of Cobra Trooper. Accessories: dark brown rifle (07 Cobra's), dark brown acetylene torch (08 Torch's), dark brown mantle with red shoulder pads (08 Barbecue's), dark brown backpack (08 Torch's), red fuel tank (08 Torch's), black Cobra figure stand. These COBRA troopers are experts in flamethrowers and all other equipment that produces fire. As arson specialists, they are in charge of state-of-the-art flame projectors, which not only spew burning streams of jellied gasoline, but also destroy the ozone layer! Encased in fire-resistant suits, they can survive the intense heat their weapons produce. This trooper, assigned to a desert assault team, adds excruciating heat to an already hot environment, to create perimeters of flame or waves of fire, both of which are intensified by the burning desert heat. "We're told you can smell us coming - a pungent whiff of gas, charcoal, and hot metal. In case you miss that smell, though, you just have to listen for a metallic scraping sound. That's the spark igniter. If you hear that, then it's too late to do anything about it." Accessories: dark brown submachine gun with detachable magazine (08 Beachhead's), dark brown extinguisher pistol (08 Barbecue's), tan helmet (07 Cobra's), tan helmet with red chevron, black mask, and silver goggles (07 Air Trooper's), black belt with brown pockets (08 H.I.S.S. Driver's), dark brown backpack (08 Barbecue's), silver tanks with black logo (08 Barbecue's), medium-length black hose (common), black Cobra figure stand. 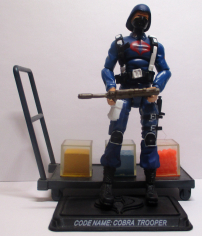 These COBRA trooper are experts in hostile environments, which means they know how to create a toxic area - and how to clean it up if necessary. Their specialized gear lets them safely work with dangerous substances and enter hazardous situations. Some may consider it a punishment to be recruited for this job, but these troopers relish their work, which amounts to poisoning and polluting an area to gain control of it. This trooper has received special training in heat-reactive combustible chemicals as part of his assignment to an elite COBRA desert assault squad. "Nothing puts a smile on your face like whipping up a cloud of toxic gas that'll send the G.I. JOE team coughing, gasping, and running in the other direction." Accessories: black bullpup-style machine gun with silver casing and curved magazine (new), black machine gun/grenade launcher with triangular stock (new), wide blue, flared helmet with cheek guards (new), blue zipped-up vest with high collar and four black pockets (new), large black pouch backpack with two side pockets (new), black Cobra figure stand. COBRA TROOPERS make up the bulk of the COBRA organization's fighting forces. They may be the "grunts" of this vast army, but they are, nevertheless, highly trained in combat techniques, martial arts, and sabotage. Failure is not an option in the COBRA army, so COBRA TROOPERS must either win every battle they fight - or die trying. Aggressive and overconfident, they will face any enemy, even the ninja commando SNAKE EYES. How could one lone ninja hope to defeat a squad of ruthless troopers who are armed to the teeth? Simple: he can't. "We fear no one. Even a battle-hardened soldier or elite ninja has weaknesses that can be exploited to our advantage." Accessories: black bullpup gun with silver casing (09 Cobra Trooper's), black heavy gun (09 Cobra Trooper's), grey spring missile launcher with black endcaps and Cobra emblem (new), two red spring missiles with long thick section before tip (new), red helmet (09 Cobra Trooper's), red vest with black pockets (09 Cobra Trooper's), black backpack with red peg (09 Cobra Trooper's), black Cobra figure stand. Toy Notes: Boxed in a set with Cobra Commander, Cobra Officer, Cobra B.A.T., and Duke. Item #39183. The figure itself is identical to the Cobra Officer; the only differences are the helmet and personalized figure stand.